THE UNEMPLOYED EATER: FREE Yogurtland Next Friday in Santa Monica. And Other Shenans. FREE Yogurtland Next Friday in Santa Monica. And Other Shenans. This summer Santa Monica plans to once again partake in the so-called "Picnic on the Promenade.' 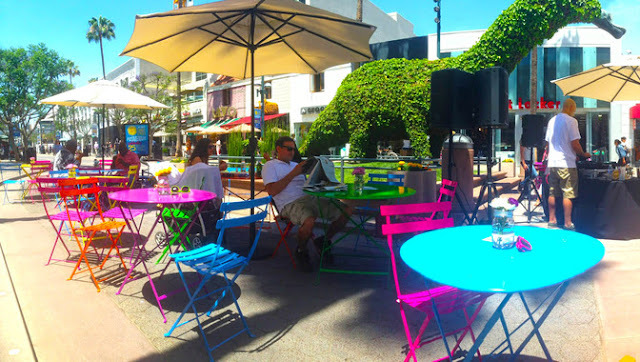 Every summer Friday, starting on July 10th, the Third Street Promenade will be packed with the luminous tables and chairs you see in the picture above. Aside from card and board games scattered about, each Friday will feature a different event. Enough with the formalities though: FREE Yogurtland on 7/10. That's all that really matters. Picnic on the Promenade goes noon to 3 pm. The full schedule can be found here.